IPL 2019: CSK beat RR by two wickets to cement their position at the top of the points table. 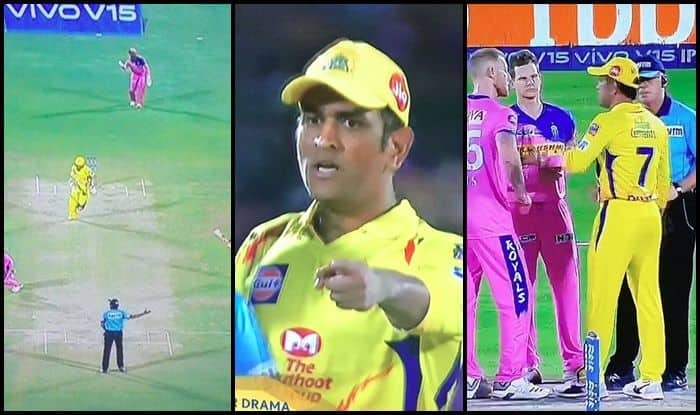 IPL 2019: MS Dhoni lost his cool, it happened at Sawai Mansingh Stadium. Dhoni is one of the coolest cricketers in the world and it would be difficult for fans to recall the last time they remember Dhoni getting angry. But it happened in the last over during CSK v RR. The umpire stretched his hand out off the second ball of the over. MS Dhoni and Ravindra Jadeja felt that it was a no-ball and calculated things accordingly. But, suddenly during the penultimate ball of the over, CSK camp realised that they were wrong and they had miscalculated. The umpire was never given that decision and that irked Dhoni, who walked onto the field to have a word with the umpires. After the heated discussion, Dhoni had settled for it not being called a no-ball. Dhoni was cheeky at the post-match presentation where when asked ‘What was happening at the end there?’, Dhoni was straight-forward in replying, “Are you speaking about the last over?’ Chennai beat Rajasthan Royals which cements their position at the top of the points table. Dhoni smashed 58 off 43 balls to help CSK gun down an in-between 151. Dhoni’s innings was laced with three sixes and two fours. It is Dhoni’s 100th win as captain in IPL.